absenteeism | Back Off, Bacteria! Giving everybody feelgood is just like a pay rise – and you save thousands! It’s feelgood all round. Extra enthusiasm, extra commitment, extra effort – and all on the same salary everybody’s getting now. Your team are switched on and going for it – pushing productivity through the roof. Actually no, it’s achievable right now – and easier than you think. Without stretching anybody either. They’re all on the same workload, working the same hours – no slaving into the evening or taking stuff home. Doing exactly the same thing, but doing it better. You see, it’s not MORE that they’re giving – more effort, more concentration, more input. The difference is that you’re removing the gremlins that HOLD THEM BACK. You read that right, HOLD THEM BACK. Because you might think your team are giving their all – and they might too. But reality is, they’re underperforming. Always have done. And always will, unless you do something about it – an experience shared by every business. You’re even underperforming yourself. You’re a human being, just like them, so you personally feel the same hindrances. Humour us, and just pause a while. A bit of a sniffle because it’s winter. Head a bit stuffy in the heated office. Muscles still twingeing from the weekend’s DIY. Which means you’re not exactly 100 per, are you? You’re a bit down, but you ignore it. Put it to the back of your mind, so you can get on with things. Full marks for commitment, but how about concentration? That razor sharp mind that got you where you are is not as quick as it might be, is it? OK with routine, but dragging its heels on the real stuff. Straining for that competitive edge where it counts. No, it’s not a criticism. And you’re not alone. So don’t worry, we all feel like that. Not all the time, obviously. But often enough that our functioning is under par a lot of the time, not fully capable of giving our all. And this might be us on a good day. On a bad one, it’s more of a struggle. Like when that cold or flu really takes hold. Not so bad that you can’t come to work, but enough to make you seriously miserable inside. Uh, huh. So how good is your concentration now? The world is not co-operating, is it? Making everything more difficult. For instance, how much longer does it take to do things? How sure are you that you’re doing everything accurately? Bit ratty are you, with colleagues and customers – rubbing a few of them up the wrong way? There’s a price tag to all that, and it’s impaired productivity. Not up to standard, not up- to scratch, a possible loss-maker on top of the wheelspin that impaired concentration has already caused. Presenteeism, it’s called – the downside of being unwell at work. And it happens to all of us more often than we think. Our own perception is we’re on top of things pretty well all the time. Reality is, research has us underperforming every three days or so. And right there is why presenteeism costs probably TEN TIMES MORE than absenteeism – £290 billion vs £29 billion. 57.5 days of lost productivity for every employee, every year – almost three working months. Which is where we come from with a virtual pay rise. If you could take away the gremlins that make people feel off colour every few days, they would immediately perform better. Instead of being three months short of effort for every salary, you’d get full twelve months’ ration. Productivity up a third, just by removing the hindrances. In other words, by removing the causes that make people feel off colour in the first place. By removing the germs that make them feel so challenged. Oh yes. Like it or not, with lots of people working on top of each other, all in the same space, every workplace is riddled with them. We just don’t see them, so we don’t recognise that they’re there. OK, so how do you get rid of germs? That matronly voice is your mother and your mother’s mother, telling you to wash your hands. On top of which, going over your desk with antibacterial wipes is a step in the right direction. But how about all the high touch objects that everyone shares – light switches, door handles, touch screens, keypads? Start wiping those and you’ll never get any work done, the whole day will be charring out the place. Which is how it’s done of course, piggy-backed with regular office cleaning outside hours. And done properly, a procedure that eliminates ALL germs completely – the whole place sterile and totally safe, every morning when the team arrives for a new day. And here we go with the pay rise again. Because what happens when there’s no germs around to make the team feel unwell? They feel better, yes – so they’re better able to concentrate. To do it for longer and more incisively. They’re bright-eyed and positive – more in harmony, finding it easier to do things. Holding back? Most of them are quite the opposite – gung-ho and wanting to do things. They have their own careers to push , and can feel themselves doing it. Which means a whole attitude shift. From bumbling along as normal to wanting to win and going for it. So ask yourself, what is the quality of their work now – the level of their productivity? And all without a pay rise – just looking out for their workplace health protection and showing your team that you care personally. Three working months per team member that could be – in additional work capability. Effort and input you’ve never had before, but been paying for all along. Enough to bankroll a real pay rise if you’ve a mind. Maybe you should go ahead and give it to them. They’ve earned it. And with a real pay rise out of the blue, there’ll be nothing to HOLD THEM BACK then. That annual office flu jab is not exactly the best protection . Only 20% effective against this year’s H3N2 virus. And hardly at all against flanking H1N1, B/Yamagata or B/Victoria strains. And zero of course against the billions and billions of other germs that surround us every day. Like your favourite and ours at this time of the year – the winter vomiting bug, norovirus. Or its happy gastric playmates – salmonella, campylobacter, e.coli. Pick any you like, between them they make us feel lousy 57.5 days a year. Not off sick and languishing in our beds mind – just ill enough to give us a horrible day at work. Barely able to cope and dying for five o’clock to come round and put us out of our misery. Especially if it’s legionnaire’s disease. Never heard of it? Very few of us have – until it crops up on OUR watch. That’s when Health & Safety throw the protection book at you. No excuse,, see? You’ve never heard of this thing, yet they’ll fine you A MILLION QUID or more for not providing protection. A nasty like pneumonia that breeds in water tanks and pipes, then goes riding around in the aircon system. One whiff of that and staff could die. Which is why Health & Safety come down heavy if you don’t take precautions. A percentage of turnover plus a custodial sentence? G4S Cash Solutions had to cough up £1.8 million. And the £1 million fine for retailers JTF Wholesale just about put them out of business when two customers died and nineteen others needed treatment. Which is why protection regulations are chiselled in stone at HSE’s Head Office in Bootle, Merseyside. By law you have to keep staff safe and protected. Not just from the molten metal machinery on the factory floor – but from pretty well any hazard that could harm staff wellbeing. Even the deadly bubonic plague, brought back invisibly from last month’s sales trip to Madagascar. Be found negligent and you could be facing a corporate manslaughter charge, just for neglecting a few invisible germs. Yes, you could get banged up for it. But more likely on your way to being broke first. Which where we get that £319 billion from. The combined cost of sickness absenteeism – £29 billion from being off sick from work. And the TEN TIMES greater cost of sickness presenteeism – £290 billion from people working at their desks unwell. Scary costs, yes – and they could easily be a lot worse. Because how good is productivity when staff struggle through their workloads feeling like death? How much should you add for mistakes, oversights, damaged relationships and having to repeat things over and over? Without wanting to be prophets of doom, here’s a simple calculator to help work it out. Scarier still is that most illnesses at work probably ORIGINATE there too. You can’t see germs. But count on it, they’re there alright – and the track record for most workplaces is not good. To make things worse, most of us have really lax personal hygiene as well. Get the picture? Already ten to one, you’re in dereliction of ensuring staff protection from germs. Added to which what would shareholders say if they knew the real impact of workplace health hazards against productivity? Bad, bad, yes – but it doesn’t have to be a disaster. Because germs can be neutralised in as little as forty minutes for around £30 a day. No viruses, no bacteria, everything sterilised to zero everywhere in the office. Real protection – with all germs safely eliminated after everyone has gone home at night. In one hit you reclaim most of the sickness costs of both absenteeism and presenteeism. All except those caused by muscular pain and being stressed out. With staff back to feeling healthy and revved up, productivity starts nudging upwards again. Health & Safety are off your back with all hazards removed. And chances are good you don’t even need company flu jabs any more. Amazing what a little protection buys, isn’t it? If it ain’t broke, don’t fix it is how the saying goes. An attitude that’s costing British businesses £319 billion a year. That’s the current price tag for UK absenteeism (£29 billion a year) and presenteeism (£290 billion) combined. Money paid out to cover absentees – people taking off sick from work. And presentees, who cost 10 times more – sick people going to work anyway, and trying to wing it. Not that British businesses are ignoring the problem. Sick leave and low productivity are familiar gripes around every board room table. We’re familiar with the issue, but don’t do anything about it. Meanwhile £319 billion is not exactly chicken feed. More than twice the cost of the NHS budget – the cost of caring for A WHOLE COUNTRY of sick people – it makes even Brexit look like a sideshow. Businesses KNOW the problem. And freeze up tharn, like a rabbit in the headlights. Sure, illness happens. It’s a downside everybody faces. What can you do? None of your corporate fitness or wellness programmes, that’s for sure. Already set to be worth £20 billion by 2020, they’re focused more on keeping well people well than physically avoiding illness. Where is the health protection package that actually prevents illness? Apart from the flu jab option offered up as an afterthought, you’d be hard pressed to find one. Which makes even less sense when you think about it. That British businesses are haemorrhaging cash to the tune of £319 billion a year in illness costs, and just accept it. Yet at the same time are gleefully prepared to spend £22 billion a year on health and wellness. It’s not as if the cause of illnesses not known either. According to the ONS, more than half of sickness absences are directly related to infections caused by germs – minor illnesses 33.1%; gastrointestinal problems 6.6%; eye, ear, nose and mouth issues 4.5%; respiratory conditions 3.5%; headaches 3.4% and genito-urinary problems 3.0%. Against that, any attempt to stop germs are pretty well zero, with most workplaces positively teeming with health hazards. These risks are compounded by low levels of personal hygiene. That leaves the only defence against germs, if any, to the nightly char service. The quick once-over at £20 or £30 an hour to make the place neat and tidy, never really intended for anything to do with health. A missed opportunity – because for only another £30, the whole place could be sterilised throughout, eliminating all germs entirely. No viruses, no bacteria, no fungi – no illnesses to catch, no need for time off, no underpowered staff unwell at their desks. Well at £30 a day, it’s not expensive to fund out, is it? Not when there’s £319 billion waiting to be clawed back. How many staff wellness plans actually prevent illness? Most staff wellness plans are anything but. They might promote staff wellness – and certainly a lot of feelgood. So as staff reward programmes they have their place. Trouble is, they tend to work on the Pareto principle – that 80% of employees justify only 20% of the costs. And the costs, particularly in the US, are eye-watering – over $6bn (£3.74bn) annually and 70% of Fortune 500 companies have them in place. But there’s wellness plans and wellness plans. Most staff are already well and reasonably healthy. So that “wellness” in reality means “lifestyle management” – diet, exercise, and lifestyle changes aimed at keeping them healthy. Not active intervention to prevent them becoming ill. The rest of the workforce most probably do have a problem. Usually a chronic condition that employers have already compensated for, such as wheelchair access. Either that or management and staffer recognise some kind of impaired performance and make allowances. There is an issue though, that most staff are already well and reasonably healthy. MOST of the time yes, but not all of it. It’s not that they are sick and have to be absent. But pretty well all of us are aware that every so often we are not ourselves and struggle to get through the day. Every so often happens more often than we think. Around every three days according to research by Benenden Healthcare Society. Usually nothing serious, perhaps a cold or flu, a stomach upset, headache or muscle injury. Enough to affect our performance though. How well we know that things takes twice as long when we can’t concentrate. That figures never seem to add up the way we want them to. And that every single detail is ten times more complicated than it is normally. Presenteeism, it’s called. People coming to work unwell and trying to do their jobs underpowered – to a greater or lesser capability, EVERY THREE DAYS. Already experts calculate UK absenteeism costs at £29 billion at an average of 6.6 days off for each employee annually. But presenteeism is estimated at ten times more than that – £290 billion and 57.5 days a year, almost three working months. Three working months is a major chunk of lost productivity – a condition that ALL businesses have to accept, usually without realising it. Assuming full time attendance, managements pay out annual salary packages to a Full Time Equivalent (FTE) of 2,080 hours – ie, 8-hour days at 5 days a week. That’s not what they’re getting though. Thanks to varying degrees of illness, stress and pain, their actual FTEs are closer to 1,620 hours spread over the full 12 months. 460 hours are gone missing, never to come back. That’s worse than the average 31 hours a month lost in meetings (372 hours annually), or 520 hours a year lost in recovering from distractions. Hold up, though. Meetings and distractions, it’s possible to do something about. Minimise them, or don’t have them at all. But presenteeism is about the health of bodies – downers that affect human unit performances. With 460 hours gone missing, effectively 25% of all salaries are paid out to achieve zip. Which is why most staff wellness plans achieve zip too. How can a package geared to diet, exercise, and lifestyle changes possibly address the more serious challenges of illness, stress and pain? OK, pain is difficult to counter. Perhaps ergonomics can soften the impact – a kneeler stool for backache, support panels, extra cushions. Visiting or in-house massage facilities can also help. Failing these, management and staffer have to accept a mutual level of reduced performance. Well stress, mental illness, call it what you will, needs time more than anything else. Time for listening, time for being aware – and time to address possible resolutions. Already time, or not enough of it, is a major cause of workplace stress and anguish. Not enough hours in the day, always working late, weekends down the tubes, holidays cut short. Add not enough sleep, and the always-on syndrome of emails and social networks intruding everywhere – and it’s hardly surprising emotional outbursts and irritable flare-ups suddenly happen. Time also solves worry. The insidious feeling that eats up one’s insides and even triggers illness. Worries about relationships, finances, children, home issues, schooling, image and self-worth. Anguish about bereavements and self-confidence through the floorboards. Give them time to be looked at, understood and shared. Time to be resolved between conflicting parties. Or simply time off to go and sort an issue – talk to the bank, consult a child’s teacher, visit a loved one in hospital. Above all, cut the wheelspin – time lost after-hours because things aren’t organised to happen within the proper working day. If people are always working late, either something’s wrong, or there aren’t enough staff. Fix it. Which leaves illness. Being unwell at work – where most of the missing 460 hours are lost. Expensive time this, multiplied by the number of employees. Yet amazingly, the least expensive to do anything about – and almost entirely recoverable. 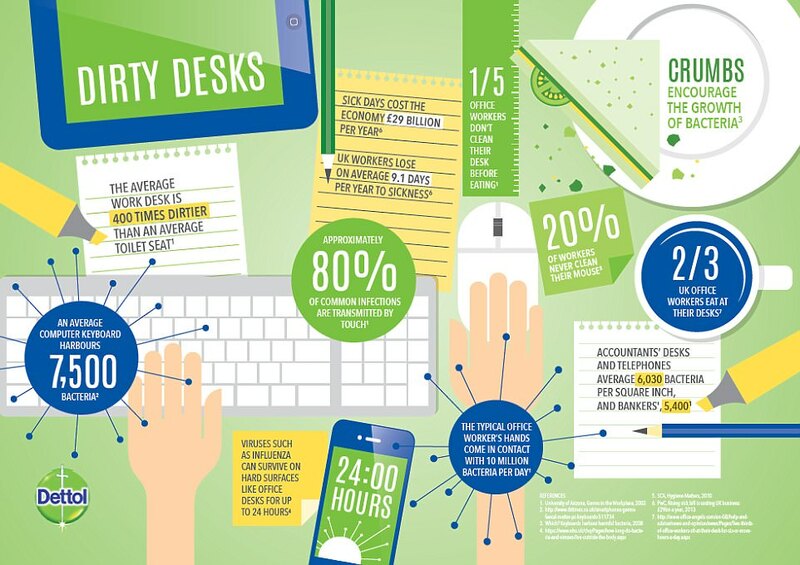 Take a look at the typical workplace. Everybody all in the same place, right? Often open-plan, to unify them as a team, so they’re all right there on-the-spot, to network and inter-relate immediately. Which is how so many illnesses happen. Because, like it or not, the average workplace is anything but a healthy environment to spend 8 hours a day in. Our own personal hygiene is not much better. You’ve got it. A major cause of workplace illness is the workplace itself. Human assets unprotected from the germs that lurk there. Which means take away the germs, and people can’t get ill any more. Not at work, at any rate. And with no germs around, it’s less easy to pick up bugs from each other too. With zero germ-level, viruses and bacteria have to work twice as hard to infect anybody. And with no illnesses, the business gets most of its 460 hours back. Time already paid for, but now ready to finance relieving the pressures of stress and anguish. Which where a decent staff wellness plan really scores. By protecting staff health, effective FTEs increase from 1,620 hours back to a full 2,080. Productivity for every employee UP BY NEARLY A THIRD. Well, what are you currently spending on office cleaning? £30 a day, £50? Double that and you can sterilise the entire place every night. £30 a day for a return of – how many staff do you have? At a third of how many salaries? You do the math. Oh, and if you feel sick about the figures, better sort out your staff wellness plan sharpish, before you come down with something worse. The usual pitch for wellness programmes is to advance employee health. That’s if you believe the glossy brochure. Ask any bean-counter and you’ll get one of two answers. In the US, a wellness plan is about reducing insurance costs that underwrite employee healthcare. The UK is closer to the mark, where a wellness plan aims to slash absenteeism. Not really health-related at all, either of them. More geared to pushing productivity. Work harder, work longer – here’s a bribe to persuade you. Most staff would probably prefer more money. But if the feelgood perks are dishing out, sure why not? Just don’t expect protection from illness – that’s not on the radar. People get sick, it happens. That’s their lookout, not their employer’s. Besides, KEEPING well is easier to handle than illness – that’s what doctors and hospitals are for. Which is why pretty well all wellness programmes avoid it like the plague. Wait a minute, flu shots! We’re talking rubbish, right? Well no, because against this year’s virus particularly, flu shots are only 20% effective. And we’re up against FOUR types of flu, not one – H3N2, H1N1, B/Yamagata and B/Victoria. Plus flu is not the only bug to knock us flat on our backs. What about norovirus, the winter vomiting bug? Or all the other gastric nasties – salmonella, campylobacter, e.coli and c.difficile? What do wellness programmes do to stop any of them? For Pete’s sake, they even encourage them! Ever heard of gym germs? According to Fitness Magazine, “Gyms are hotbeds of germ activity, researchers say.” All that sweat and gasping breath. Just the place to pick up colds and flu, norovirus, staphylococcus, streptococcus, MRSA, athlete’s foot, hepatitis, take your pick. Some wellness programme! And who’s going to believe you got sick in the gym? Meanwhile, the average office isn’t much better. There’s another thing about wellness programmes. We all get signed up, and then we have to DO something to make them work. Actually go to the gym classes – in our own time of course, lunch or after work – never office hours. Same thing with the health checks, the smoking clinics and everything else. Busy-body employers, who do they think they are? We’re lazy at a personal level too. Unthinking and unobservant. Which makes us our own worst enemies. How can we get revved up about a wellness programme when we can’t even help ourselves? Which means for any kind of plan to work, it has to assume we do nothing. We arrive for the nine-to-five thing, sit there like a sack of potatoes and it all has to happen around us. Laying a guilt trip on us because two-thirds of us are fat isn’t going to crack it. And anyway, if we DO go to the gym, it takes six months before any of that flab visibly comes off. No, no. Any SERIOUS wellness programme just has to happen. Like in the background while we’re not looking. HEPA filters in the aircon maybe, taking out the germs – fine until the penny drops that most germs are too small to be caught. How about the nightly cleaning brigade? Mop and buckets, plenty of bleach – problem sorted. Except the bleach stinks, so everybody has a headache – and the rub and scrub never gets to the hideaways where germs wait to grab us. Nope, nope and nope. For a wellness programme to work, it has to prevent illness. Germs are easy. Sterilise the entire place on a regular basis, so there aren’t any. No germs, no illness – sorted. Stress is more difficult. People clam up when it’s personal – emotions and worry going round and round. Which takes listening, understanding and lots of time to get right. Except time is suddenly something you have a lot of. Because there’s no germs, people are at their desks more. They’re feeling better about it too – without the nagging off-colour complaints that ALL of us go through every three days or so. All adding up to the 57.5 days of being at work but unwell with it – not able to concentrate properly, making mistakes and dragging our heels through the day. Yes, time. Time to talk and reach out. To relate and demonstrate concern. To take off and sort out the circling monsters that bring work to a halt – child care, finances, relationships, bereavement, accidents and personal responsibilities. Make the stress go away and there’s more time than ever. Not much you can do against something this physical. Bones and muscles out of whack. Cramps, injuries, spasms. Unless you give away time for this too. Time for physiotherapy, massage and heat treatment. Maybe even at the office if it helps. Rescue sessions on the spot to ease the agony and up the commitment to perform. All paid for out of the time reclaimed from getting rid of stress and germs. So wellness programmes, get real. Why does British productivity keep dragging its heels? Because £319 billion of health issues are holding us back. All the other things – lagging investment, ageing infrastructure, accelerating technology, diminishing experience and ever-younger staff – they’re all fixable, usually by throwing money at them. But an unwell work force is not even on management radar. Workers’ wellbeing yes, fitness packages, health advice and feelgood incentives are all over the place. But £319 billion of unwell costs? Is anybody looking? Do they even know it exists? Because that kind of money is not chickenfeed. More like ten times our defence budget. Three times the Brexit get-out bill. Two-and-a-half times the NHS budget. And still nobody’s twigging it. Management, government and consultants are all gung-ho, demanding full throttle. Meanwhile we’re still shackled to the wall, brakes hard on and going nowhere – the least performing economy among leading G7 countries. Lots of noise, but just wheelspin. You see, £319 billion is the all-up cost of being unwell among work staff. £29 billion for absenteeism. And £290 billion of presenteeism – people not well, but going to work anyway, a growing measure of wonky job security. Since 2008 and the financial crash, absenteeism has been falling steadily, down around 20%. Good, right? Presenteeism however, already 10 times greater – is on the increase. Exactly how much is hard to calculate. Staff are reluctant to admit they have a condition, even to themselves . Many are convinced showing weakness could cost their jobs. So they tough it out, pretending otherwise. We’ve all been there, to some level or other. Choosing to go to work with a cold, instead of staying home. We won’t get paid and it could be a black mark. Better than finding a replacement’s been hired while you weren’t at your desk. So we go to work anyway, dosed up to the eyeballs. Day Nurse or something like it – so concentration is a bit loopy, there’s maybe a headache, blurred vision, ringing in the ears and we’re irritable as all hell. Not exactly the best way to ensure proper service and attention to detail. A trap for making mistakes or oversights too. And isn’t it a drag that everything takes so long? Oh, and yes. We sneeze and throw tissues around, so our colleagues come down with it too. Or failing that, the HVAC system stirs our germs, upholding equal opportunity. Or maybe it’s not a cold, but something worse. Flu, or a tummy bug, picked up from one of those high-touch surfaces around the office – door handle or light switch, or the START button on the photocopier. You can see it, can’t you? We’re not ourselves when we’re not well. And most of us wind up with some kind of issue – minor injury, sprain, cut, infection, or food reaction every three days. All of which is how come presenteeism is as high as it is – an average of 57.5 days a year, almost three working months. A quarter of a year lost to unfocused and non-concentrating minds – some ball and chain! Which of course is why productivity is continually as low as it is. Businesses are paying for a full twelve months’ performance, but staff are only capable of delivering nine. On top of that is the knock-on effect from errors and omissions made while unwell at work. A lot of money and a lot of time, with often below-standard levels of quality. One heck of an issue not to be aware of – and one heck a lot of money to lose without realising it. The elephant is in the room, but nobody has recognised it yet – all £319 billion of it. And fixing is just as invisible. Getting rid of germs is push-button easy for around the same cost as daily charring – a demonstration to staff that management actively cares for their health AND wellbeing. But it needs an attitude shift to capitalise on it. The workplace might be germ-free and sterile, but it has to be kept that way. If staff pick up an illness from outside, no matter how small, they should be encouraged to stay away. Because they spread germs that colleagues can catch. And because in their germified state, they contaminate everything they touch. Encouraging a stay-away reassures staff, protects colleagues and promotes goodwill all round. And anyway, with flexible working, being out of the office is no longer as critical as it was. If staff REALLY have to participate, they can log on remotely from home. Though the understanding should be that if they’re not well, they’re not well – and being released from work responsibility is a function of getting better. Understanding and sympathising with staff is in any case, a crucial component of engaging with them. They could equally be working from home because of a bus strike, or handling a personal issue – children’s needs at school, handling a home breakdown, going to a funeral. Because germs are only one of the reasons staff are unwell at work. Stress is another, all too often also unaddressed by management. But getting rid of germs buys a lot of time – remember the default is nine months’ productivity instead of twelve – management can afford to be accommodating. Which is exactly what stress needs – time. Time to listen and time to interact. Much of the anguish of stress at work is relieved by voluntarily giving an audience – listening to problems, complaints and suggestions before they become issues. They might not be big in the scheme of things, but in the head of the staff member troubled by them, they can be monsters. And time is there to buy good will. No longer refused or grudgingly granted just this once. Now it’s possible to give away without loss – reclaimed from the missing 3 months productivity forgotten and unrecognised until now. And all started by pressing a button to get rid of germs. No holding back now, productivity should be free to advance however is required. Bye-bye ball and chain. Oh, and no more £319 billion price tag either. As we said in a previous post, watch out world!